“Should a congregation display flags in its sanctuary?” Periodically this question is asked by a congregation when considering what is appropriate to the environment of the worship of the people. Unfortunately it often elicits considerable debate and controversy. The display of flags in church sanctuaries is far from a universal practice, and controversy has long surrounded the practice. In considering this issue, certain theological-liturgical issues need to be addressed. The Church is universal. It transcends any one nation, since people of every nation on earth are embodied in the church of Jesus Christ. We affirm this each time we sing “In Christ There Is No East or West . . . no South or North.” The use of a flag of any one nation tends to conflict with this conviction of the universality of the Christian faith. For this reason, the display of a national flag in a place dedicated to the worship of God is discouraged by many church leaders. Christians furthermore profess to give supreme loyalty to God, and place allegiance to God above allegiance to the state. Whenever flags are displayed in church sanctuaries, this issue becomes important when determining where to place them. Which flag (i.e., if the “Christian Flag” is displayed along with the United States flag) is to be given the place of highest honor? Codes of flag usage dictate that the American flag should always be given precedence. But when considering the question of flag display in the church it is important to note that the established code for placement of the American flag is basically a military rule, and is secular in nature. It is not binding for civilian use. Prescribed usage was established by the United States government for use by the American armed forces, but no federal law binds civilian usage. However, in June 1943, Congress codified “existing rules and customs pertaining to the display and use of the U. S. flag in public places.” These reflect the practice of numerous patriotic societies. The military rule designates the place of honor at the speaker’s right if the flag is on a platform or chancel, and at the people’s right if its position on the floor level indicates it as the people’s flag. In churches that display flags, “the Christian flag” properly takes precedence over any national emblem to make it clear that for Christians, allegiance to God has a higher claim upon us than allegiance to any nation. This is underscored in General Assembly responses to overtures concerning flag use. General Assemblies of Presbyterian churches that are now part of The Presbyterian Church (U.S.A.) have adopted resolutions touching on this subject. While affirming that within the Christian tradition the Cross is a sufficient symbol for loyalty to God, General Assembly also recognizes the generally accepted Christian flag, not as something important in itself but as a symbol of the Kingdom of Our Lord; sanctions its use, on appropriate occasions, in churches and during services of worship, either by itself, or with another flag or flags; and urges that whenever the Christian flag is used, it should have the place of honor, worthy of the Kingdom for which it stands, and should never be subordinated to any secular flag. 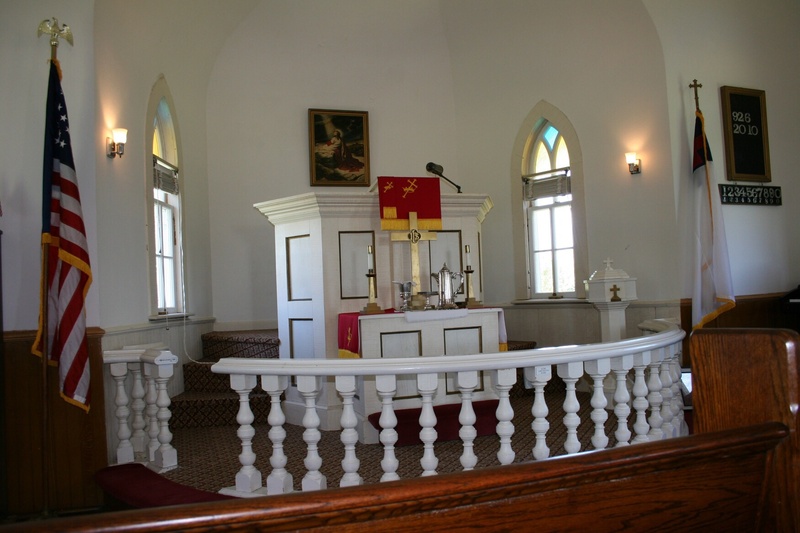 This means among other things, according to the generally accepted code, that it should have the highest position if one flag is above another, it should lead in processions, it should be placed on the right of a minister or speaker if used on the chancel or platform or on the right of the congregation or audience if standing on the floor. This statement makes it clear that where the national flag and “Christian flag” are displayed together their placement symbolically implies where supreme loyalty is placed by the body assembled there. That since there is such a divergence in the use and placement of most symbols in the sanctuary, and since there is no rule or directive in The Book of Government and Worship on the matter of the placement of flags and symbols, we believe that it therefore becomes the matter of each Session to determine for itself the mode and manner of displaying flags within the sanctuary. A compromise placement of the flags some churches use is the rather awkward arrangement of placing the national flag outside the chancel at the right of the congregation (as it looks forward), and “the Christian flag'” at the right of the minister inside the chancel, thereby giving a place of honor to both flags. It may be, however, that this arrangement makes other implications that are best avoided. Since we profess God as sovereign, claiming our highest allegiance, and since God’s realm extends beyond the bounds of any one nation, embracing all nations, it is preferable that no national flag be displayed in a Christian place of worship. It is claimed by Thomas A. Stafford in Within the Chancel (Abingdon, 1955), that the “Christian flag” was first conceived in 1897 by a Sunday School superintendent at Brighton Chapel, Staten Island, New York. It was on rally day and a guest speaker failed to show up. The superintendent filled in with an extemporaneous talk on the symbolic value of flags. Pointing to the American flag draped on the piano, he expressed the need for Sunday schools and churches to have a distinct flag and proposed its design to complement the color of the American flag, giving each color meaning. Such a flag was made and used at Brighton Chapel. A red cross was introduced to signify Christ’s sacrificial death for humankind, white to signify purity and peace, and blue to signify faith, trust, and sincerity. The whole flag signified “peace on earth, good will among men.” A decade later its use was popularized by the Methodist Young People’s Missionary Movement, and a pledge of allegiance to the Christian flag, parallel to the pledge of allegiance to the flag of the United States, was introduced by the pastor of Brighton Chapel: “I pledge allegiance to my flag and the Savior for whose kingdom it stands; one brotherhood uniting all mankind in service and love.” As Martin E. Marty summed it up in a Christian Century essay on flags: “There you have it. All because of a speaker who did not show, a man who filled the empty space with words, a mass-production-minded Methodist, and a pledge-writer” (Christian Century, March 17, 1982). It is important to note that this flag, popularly identified as “the Christian flag,” has no proper claim for being the Christian flag. It does not have universal acceptance. It is rarely, if ever, used outside the United States. Even in those few denominations where you can find this flag used, its use is not universal. This flag therefore has no claim to being a unifying symbol of the Christian faith, but was clearly developed in reference to the flag of one nation – the United States. Even its color – red, white and blue – betray a design to harmonize with the flag of the United States. Let it be underscored that it is the cross itself, rather than a flag, that should be seen as the universal symbol of the Christian faith. Because of this many church leaders affirm that neither the flag of any one nation or the so-called “Christian flag” belong in the place of worship, because they fail to express the universality of the Christian faith, and contribute to an ambiguity about loyalties.